Mike Kuhlow, Controls Engineer with Algus Packaging, discusses the benefits of using Banner's column lights and SC22-3 Safety Control with the Algus U8/U8X Universal 8 Packing System. Algus Packaging Inc. is a leader in the heat seal and thermoform packaging industry. They design, develop and manufacture high-performance sealing machines, thermoformed packaging and offer full service contract packaging. The machinery and services offered by Algus provide their customers with the ability to change and grow as business needs dictate, now and in the future. The Universal-8 (U8/U8X) rotary sealer was designed by Algus for maximum flexibility. This agile machine has operational capabilities in a broad range of packaging applications and offers tremendous versatility in system operation. The modular design of the U8/U8X makes it easy to implement multiple machine configurations, alter equipment and expand the system, on-site and with minimal downtime. Safety functions on the Universal-8 include three E-Stop push buttons and metal/Lexan doors with positive break electrical safety interlocks. These features had been managed using conventional serialized safety circuitry. The wiring was daisy-chained to several terminal blocks and redundant wiring connected to an input module. Algus wanted to simplify and centralize this system and build in additional functionality. Algus chose the SC22-3E Safety Controller from Banner Engineering. The SC22-3E offers 22 available input terminals with versatile input circuitry. This made it easy for Algus to integrate all the existing safety functions available on the U8/U8X into a central location while providing the flexibility to incorporate additional features in the future. Ethernet connectivity on the SC22-3E allowed Algus to embed safety input and output monitoring capabilities into the U8/U8X. Algus wanted an at-a-glance equipment status solution for the Universal-8. The solution would need to be cost-effective, easy to see and have a rugged build. The EZ-LIGHT™ CL50 Column Light from Banner provided Algus with a status light bright enough to provide clear indication of system operation at a distance and even in daylight. The LED light source ensured that Algus had a highly visible solution with long operational life and low power consumption. Housed in a completely self-contained IEC IP67 rated enclosure, the CL50 is ideal for challenging environments. It required no assembly and the available M12 connector made it easy to wire the light directly into the U8/U8X, resulting in reduced installation time. 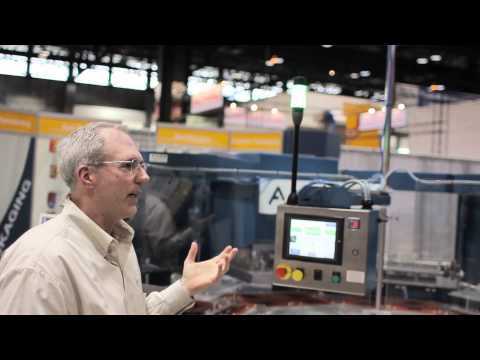 – Mike Kuhlow, Algus Packaging, Inc.
By integrating the SC22-3E Safety Controller, Algus was able to dramatically reduce the complexity of safety function management while accommodating future changes. The selection of the EZ-LIGHT CL50 Column Light provided Algus with an easy-to-see, easy-to-implement equipment status light solution. The simplicity and flexibility of the Banner products allowed Algus to expand operational functionality and build in additional features to the Universal-8 while complimenting the versatile design of this high-performing packaging system. Rugged, cost-effective, & easy-to-install multi-color indication in a single segment. No controller needed. 1-, 2- or 3-color models available.